GLN has a new home for languages! After 14 months of careful planning, EC Washington and GLN are excited to announce a language-learning partnership that will meet every need. 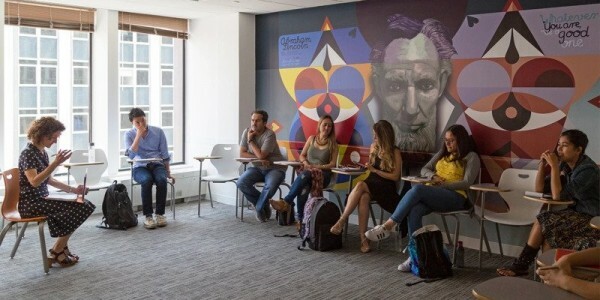 The search for a new home for GLN’s dynamic educational and professional development-oriented programs is resulting in an opportunity to learn in a new integrated classroom space for GLN’s extensive language classes. Thanks to the efforts, diligence and optimism of GLN’s Founder, Executive Director and President, Andrew Brown, in collaboration with Amanda Ross-Gomez, Regional Center Director – EC Miami & EC Washington, and the rest of the dedicated team at EC Washington, GLN is excited to announce that our spring classes will take place in convenient and metro-accessible Farragut. Special thanks go to Martine Mangion, Director of Operations, North America, for her instrumental role in facilitating this partnership. Additional special thanks are offered to Steve Solomon and the dedicated team at Blake Real Estate for all of their assistance and preparation for this partnership. In the heart of Washington, DC, EC Washington and GLN are now working together to provide professionals and aspiring professionals with the linguistic, intercultural and interpersonal skill-building tools that are needed to get ahead in today’s world. Together, these organizations are launching a new partnership for the best way to learn languages. Take your career and personal development to heights that you can only imagine by joining EC Washington and GLN for all of your language-learning needs. EC Washington and GLN have a lot in common with both being customer-focused five star experiences. EC Washington will work with you to provide a fully immersive English learning program that will give you the foundation you need to build your confidence and abilities in the English language for lifelong success. GLN is confident that this new space combined with our excellent professional partnerships with DC’s best organizations for global education, will provide you with a fantastic spring semester. With options ranging from general and intensive English to a full academic semester or year of learning or to a focus on English for business communication, EC Washington allows you to adapt your English learning to a schedule that fits your needs. You can customize your English language education with EC by choosing to flexibly learn on a schedule that works for you. Featuring the latest in cutting edge technology such as interactive whiteboards, fully integrated software and common areas that are designed to facilitate your learning, EC Washington provides you with the tools that will give you the edge when learning. Contact EC Washington today to learn about which their English language programs are right for you, your friends and your family. You can see why they are popular in cities across the US and around the world. By learning with EC, you gain access to an expanding network of global English learning. EC Washington also offers visa assistance to students in its programs. Recently voted Best on Yelp for the third year in a row, The Global Language Network is a unique intercultural nonprofit program for learning the world’s languages. Founded by Andrew Brown and dedicated to the mission of, “Using language as a tool to help fix our world,” GLN teaches a truly diverse curriculum that is designed to help you confidently build and maintain your skills in global languages. GLN offers you the opportunity to join a network of learners, teachers and volunteers who are developing themselves professionally and personally through learning and teaching the world’s languages. Sign up for 70+ language learning classes in up to five levels of language proficiency this spring in languages from around the world. Do you or does someone you know want to teach or volunteer? Reach out to GLN at teach@thegln.org for more information. Teaching with GLN is rewarding, learning with GLN is inspiring, volunteering with GLN is your opportunity to support and facilitate intercultural awareness. Register now for spring and join us in our brand new location featuring interactive whiteboard technology, new multimedia features, spacious classrooms, our amazing teachers and our curriculum that is designed to create a space of true language learning for you. Do you have questions about GLN’s classes and programs? Would you like to learn more about our new partner, EC Washington? Email us at learn@thegln.org for assistance and questions today. Where in the world do you want to go? With the new partnership between GLN and EC Washington, we will take you there. 2 Responses to "We Speak Your Language: EC – Washington and The Global Language Network, A Truly Global Partnership"
I saw a Groupon ad for a 6 week language course and was wondering what is the format for learning the language, book lessons, conversation etc…? Is the course language specific? How many days a week? What time do the classes meet? GLN is a not-for-profit organization that is dedicated to affordable, immersive language learning in over 60+ languages. This semester, we are offering approximately 90 classes in total of which 20 are new classes for six weeks from late March/early April through mid-May. Our summer semester will begin in early June and will last 6 weeks. Our next round of 12 week classes will start in September. The Groupon promotion is available to first-time students at The Global Language Network. Our approach is conversationally-driven to help you to really speak and communicate in your chosen language. We offer 5 different levels of curricula that help you build linguistic and cultural knowledge as you become more familiar with a culture. Each course is taught by a native or highly fluent trained instructor who is ready to share with you in a fun and informative way. Classes meet once per week for 6 or 12 weeks depending upon the specific course. The times are conveniently arranged on evenings and weekends. You can view our Schedule Page in the Learn tab for more information. As I mentioned, we are also personally following up with you. A great way to reach us is by emailing learn@thegln.org.